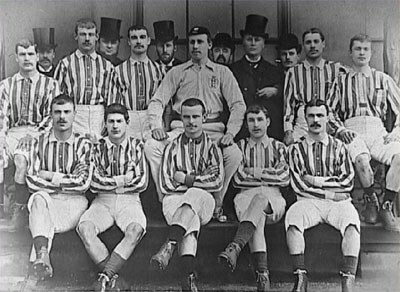 West Bromwich was one of the team that participated in the Football League the first season in 1888. They have won Division One at one occasion, in 1920. They are five times FA Cup champions and one time Football League Cup champions. Old photo of West Bromwich Albion FC from 1888. The club was founded in 1878 as West Bromwich Strollers, and when changed name to West Bromwich Albion three years later. The club's most successful period for the club came about in the last two decades in the 19th century. Between 1886 and 1895 they reach the FA Cup final five times and won twice. Famous is the victory over Preston in the 1888 final in front of 17,000 thousand spectators.